Cast-in-situ method of construction of bridges is a flexible method in which the demands of more unusual geometrical shapes can be easily coped with. Cast-in-situ methods are adopted when it is hard to transport the fabricated pars due to size or unreachability etc. The construction of a bridge can be done by the following methods. Each of the following methods can be implemented in different ways. But here we are discussing about the implementation of following methods with cast-in-situ techniques. Incremental launching method is the one in which cast in situ technique is adopted. It is highly mechanized method which saves time and budget. It is generally preferred for the construction of multi span post tensioned bridges. In this method, bridge piers are built first in required alignment. Then the superstructure part to be built is dived into number of sections. Now an area behind the one of those abutments is selected. 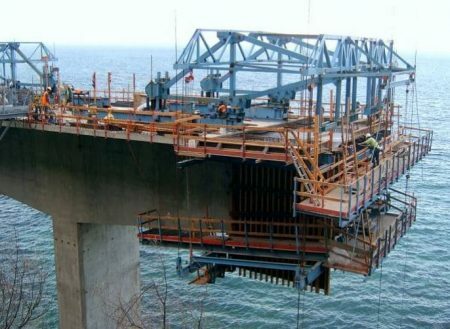 In this stationary area, a setup is made to cast the one section of bridge superstructure. After the casting of one section, it is pushed along the bridge axis using jack system or friction launching system which is arranged prior to the casting of structures. Similarly, all the sections are casted in site and moved forward along the bridge alignment. To lower the bending moment or cantilever moments in the super structure while moving, a launching nose made of steel trusses is attached to the front of bridge deck. The alignment of bridge should studied carefully. It should be straight or if it involves curves, then the curvature must be constant. The presence of casting bed is on the ground which is easily reachable so, this method provides better safety as well as reduces the cost of transporting and lifting. High quality finish can be obtained since the work is done on the good casting platform. Balanced cantilever method is the advanced method of all construction techniques since it does not require any temporary structures for support. 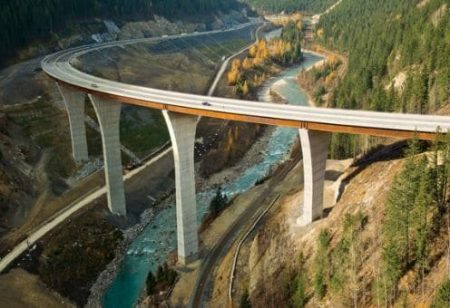 The bridges of greater heights can also be built using balanced cantilever method without falsework. Cast- in –place technique for balanced cantilever method of bridge construction is preferred when the bridge is long and contains irregular span lengths. When there are irregular span lengths then the depth of girder will vary for each span length. The molding of girders of varying depth in different depth molds is uneconomical. Hence, cast-in-situ method is preferred for this situation. At first piers are constructed which are fixed positions for cantilever part. From fixed point, cantilever part is constructed without any temporary support using staged cast-in-situ construction. This is done on both sides of the piers so, it is called balanced cantilever method of construction. Cat-in-situ Post tensioning method of bridge construction is more demanding method because of its durability and applicability to complex bridge curves etc. In this method along with concrete and reinforcement, steel strands or tendons are also used to introduce post tensioning. 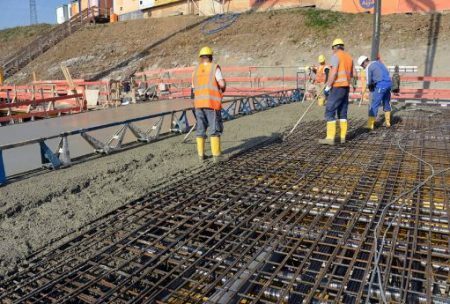 When the formwork is prepared, strands are arranged with in the reinforcement and concrete is filled. 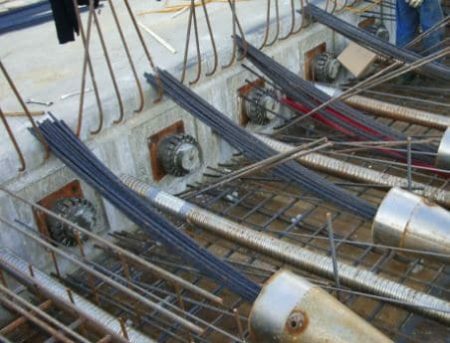 After the hardening of concrete, the strands which have been passed through the concrete are pulled by the jack up to certain tensile force which was pre-determined. Now, the steel stands should be locked. This type of construction increases the load carrying capacity of bridge and improves the durability of bridge. Post tensioning eliminates the use of intermediate supports for long span bridges. This method does not require any heavy lifting equipment or transporting equipment since the casting of super structure is done in the required position. The superstructure is safe from transportation and lifting damages. 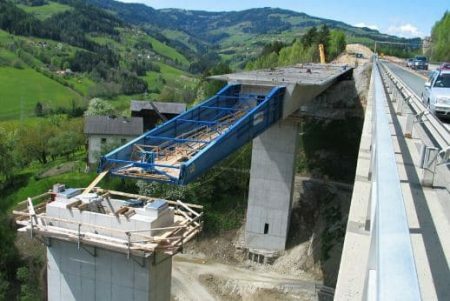 It is the best method to construct a bridge in Inaccessible areas. This method is used for Cost effective construction of solid, voided or ribbed reinforced concrete slab bridges. It is time consuming as compared to precast construction methods. If the bridge is constructing over water bodies, severe damage may occur to the unset concrete during flood conditions. This method requires large number of workers and requires skilled suprvision.